SEATTLE — Alaska Airlines faces a public-relations storm after a gay couple were forced to give up their seats on a flight from New York City to Los Angeles on Sunday to make room for a straight couple. Though the complainant Tuesday accepted an apology from Alaska, which said the outcome was a mistake and not reflective of any disrespect, dissemination of the incident on social media has damaged the airline's image. Henry Harteveldt, an airline analyst with Atmosphere Research Group, said in an interview that Alaska had previously earned a reputation as a gay-friendly airline. "As an airline analyst who has known Alaska for a long time, and who also happens to be gay, I know that Alaska and Virgin America are two of the most supportive airlines in the business of their LGBT employees and the LGBT community," Harteveldt said. But in the social-media blitz between Sunday and Tuesday, that reputation was eclipsed by a torrent of outrage. David Cooley, owner of a popular upscale gay bar in the West Hollywood section of Los Angeles, recounted the incident in posts on Facebook and Twitter. He said he and his traveling companion were on board in their assigned premium seats when a gate agent asked his companion to give up his seat and move to the economy cabin so that another couple could sit together. Although Cooley said he protested that the two men were also a couple and wanted to sit together, he said the agent insisted that his traveling companion had to either move to coach or get off the plane. "We could not bear the feeling of humiliation for an entire cross-country flight and left the plane," Cooley wrote in his posts. "I have never been so discriminated against while traveling." He added: "I cannot believe that an airline in this day and age would give a straight couple preferential treatment over a gay couple and go so far as to ask us to leave." Cooley ended his post by thanking rival airline Delta for getting the couple home to L.A. afterward and calling for a boycott of Alaska Airlines by the LGBT community. The social-media posts quickly stirred a strong reaction as some celebrities weighed in, spreading news of the incident. James Corden, popular host of "The Late Late Show with James Corden" on CBS who has more than 10 million followers, tweeted: "Dear @AlaskaAir This is no way to behave. x"
Many online commenters were more strident, saying they will never fly Alaska again. 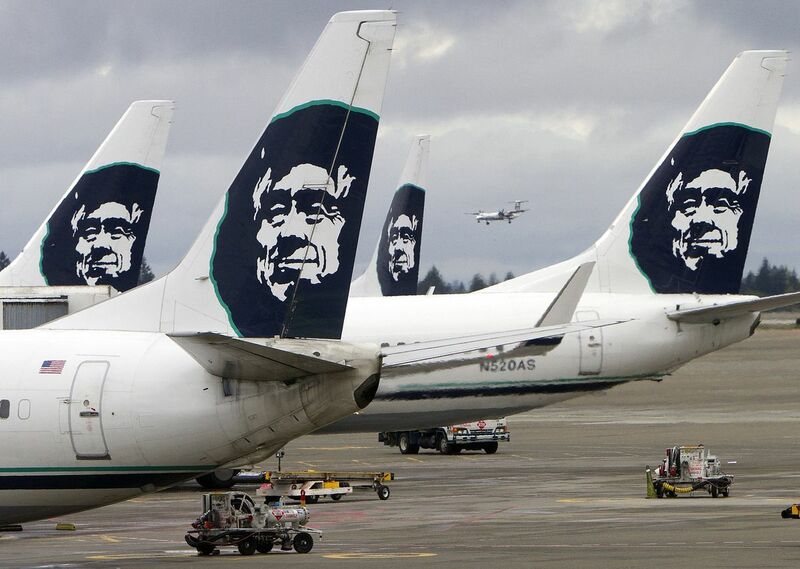 "Shame on you Alaska air for employing bigots" wrote one typical Twitter commenter. Alaska responded by posting an apology on social media that said "this unfortunate incident was caused by a seating mix-up on a full flight." "It's our policy to keep all families seated together whenever possible," Alaska's response continued. "That didn't happen here. We are deeply sorry for the situation and did not intend to make Mr. Cooley and his partner feel uncomfortable in any way." In an interview, Alaska spokeswoman Bobbie Egan said the incident was "a human mistake" made by a gate agent who didn't have full information and was merely trying to move people around so a family could sit together. "We feel terrible. It was a mistake," Egan said. "This was a misunderstanding and we own every part of it." Egan pointed out that Alaska Air Chief Executive Brad Tilden has prominently and publicly championed marriage equality and, as a Boy Scout leader, the acceptance of gay Scouts in the organization. In 2014, Tilden joined other airline CEOs in writing an open letter to Arizona Gov. Jan Brewer that helped persuade her to veto a proposed law that would have allowed businesses to invoke religion and deny service to gay people. "Alaska Airlines has reached out, apologized, and we are discussing making things right. I accept Alaska Airlines apology and appreciate it addressing the situation." Airline analyst Harteveldt said that after discussing the incident with Alaska, he believes the fault lies in the lack of information relayed to the gate agent, who should have been able to see that Cooley and his companion had made a joint reservation and therefore were together and shouldn't have been asked to separate. But he said he's certain the incident was a genuine mistake rather than due to bias against gays. "Alaska's commitment to the LGBT community has been exemplary," he said. "That's why this was just such a shock." The Alaska Airlines website includes a page devoted to "gay travel," which encourages LGBT travel and highlights gay-friendly destinations that support marriage equality, Pride celebrations, and other events of interest to the gay community. The heading on that page begins: "At Alaska, we are longtime supporters of the LGBT community and remain committed to a more equitable society." But that message was lost in the social-media storm. On Twitter, Billy Eichner, the gay actor and comedian known for his faux anger and for his TV show "Billy on the Street," responded to Alaska's online apology with a line that summed up the public-relations problem the airline now faces. "Thank you for the explanation @AlaskaAir," Eichner wrote. "But this is Twitter and it's 2018 so I will be continue to be outraged with no appreciation for fact, context or nuance SORRY!"